Last month, food startup Terramino Foods announced a $4.25 million investment through True Ventures and Collaborative Fund, in order to develop sustainable protein products using fungi. In particular, Terramino focus on alternatives to seafood, including a plant-based salmon which is now in development. 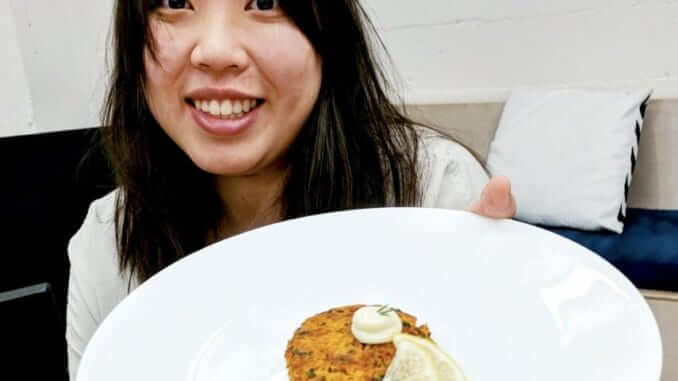 Terramino’s current focus is a sustainable “salmon” burger that not only looks, smells and tastes like salmon, but also has omega-3 fatty acids and is high in digestible protein. Their line will consist of all-natural, non-GMO and completely animal-free products. The startup was founded by Joshua Dixon and Kimberlie Le, who dropped out of college to work on the project and develop these products. Kimberlie is understandably busy since the recent funding, but took a minute out of her hectic schedule to briefly answer our questions. What kind of protein will you use for your vegan salmon? We use fungi proteins, right now this is from Koji which is a traditional Japanese fungi and superfood, for the base of all of our products (meat and seafood). How is your product unique from others? What makes us unique from many products on the market is that we are creating products using our fungi protein which has a naturally occurring texture like meat. Therefore, our products are truly a no-compromise as they have the proper taste, texture, and nutrition of meat, without the pitfalls. All of our ingredients are all natural, we don’t use genetic engineering or heavy processes like extrusion, and we use all natural ingredients to create wholesome great tasting products. How will the recent investment sum be utilised? We are using our seed funding to grow our team and develop more great tasting products. We will have tasting dinners which people can sign up for on our website at www.terramino.com, at these dinners people will be able to learn about and taste the future of food with us. We will be showcasing both our seafood and meat products. Are you seeking partners and if so, in which regions? We aren’t currently looking for any trade partners. Thank you for your time, Kimberlie!